So this cake – it almost didn’t make an appearance here on MBA. Not because it was dry, or sunken, or lacking in the taste department, but because it kind of ended up a funky color. As soon as I sliced it, my high expectations deflated a little when I noticed that the inside of the cake was an off shade of purpley-green due to the blueberries. Since I’m a bit neurotic – okay, a lot neurotic, I immediately whipped up another recipe to post instead. I just couldn’t stand the thought of sharing something that wasn’t as beautiful as I intended it to be. But then – I tasted the cake and decided that I really needed to get over myself because it was simply too darn good not to share. The bright lemon flavor pairs perfectly with tangy Redwood Hill Farm’s Blueberry Goat Milk Yogurt and sweet, wild blueberries. If you’ve never tasted Goat Milk Yogurt, I compel you to give it try – it’s unique flavor and delicate, smooth texture will introduce your palate to a completely new yogurt experience. Not only is Redwood Hill Farm’s Goat Milk Yogurt delicious, it’s also pretty good for you. They’re naturally flavored with healthy sweeteners such as organic wildflower honey, pure maple syrup and natural fruit juice concentrates. They also add a special blend of living cultures with acidophilus and bifidus to promote healthy digestion, which creates a classic yogurt flavor. Kind of a win-win, right? Lemon-Blueberry Yogurt Cake is bursting with sweet, Summer flavors that are sure to help you celebrate the last few weeks of the season. You can find Redwood Hill Farm’s Goat Milk Yogurt at Whole Food or use their store locator for a retailer near you. 1. Preheat oven to 325° F. Grease and flour a 10-inch bundt pan or spray with a nonstick cooking spray such as PAM for baking. This product contains flour and really helps with the release process. 2. In a medium bowl, sift together the flour, baking soda, and salt. Set aside. 3. In the bowl of a stand mixer fitted with a paddle attachment, or in a large bowl with an electric mixer, combine the sugar and lemon zest. Mix with your fingertips until the sugar is moistened and fragrant. Add the butter and cream the mixture until until light and fluffy; about three minutes. Beat in the eggs one at a time, then stir in the lemon extract. Alternately mix in the flour mixture and yogurt, mixing until just combined. Gently fold in the blueberries. 4. Pour batter into prepared pan. Bake in the preheated oven for 60 minutes, or until a toothpick inserted into the center of the cake comes out clean. Allow to cool 10 minutes in the pan, then turn out onto a wire rack and cool completely. 5. Once the cake is cool, prepare the glaze. To make the glaze, combine confectioners' sugar, lemon juice and vanilla in a medium bowl and whisk until smooth. Pour the glaze over the top of the cooled cake allowing it to drip down the sides. - I used frozen, wild blueberries from Trader Joe's, but fresh blueberries will work beautifully. This is a sponsored post written by My Baking Addiction on behalf of Green Valley Organics and Redwood Hill Farm. The views and opinions expressed on My Baking Addiction are purely my own. the cake looks beautiful to me, guess you are really perfectionist :P.
I’m a huge fan of lemon and blueberry combined…especially with all of the fresh berries available right now. I am adding this to my MUST MAKE list! Oh I so agree. I just LOVE the lemon and blueberry combo. I wonder where to get the Goat Milk Yogurt. I haven’t seen it where I am. You can find Redwood Hill Farm’s Goat Milk Yogurt at Whole Food or use their store locator for a retailer near you. Thanks for stopping by! I think the cake is just beautiful!! I love bundt cakes, especially made with yogurt. Yum! Looks great…. Thank you for sharing this great recipe. And if we can’t find this, or any, goat milk yogurt? You can use any type of blueberry yogurt, in fact, plain yogurt will be just fine too. Have a great day and thanks so much for stopping by. If you’d like to try our goat milk yogurts, we’re mostly in Whole Foods and other Natural Food Stores. We have a store locator on our website. Just plug in your zip code to find the store nearest you. This cake does look quite beautiful and super yummy!!! I’ve always loved lemon and blueberry together. Something about those flavors…. Such a pretty cake! Love this! This cake looks absolutely delicious! I may have to try making a wheat free version of it, yum! 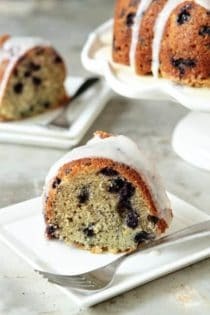 I have been looking for a good lemon- blueberry cake recipe for months now, and this one is FANTASTIC!! thank you sooo much! I want to make this tomorrow but since I live in Italy I was wondering if any kind of blueberry yogurt could be used . I’m having some difficulty in trying to find ingredient substitutions and measurement equivalents since we use grams but I’m sure I will handle it. Thanks for all your recipes ! I love the colour of your cake… it’s very pretty! I made a lemon yoghurt cake recently that worked out beautifully. I think yoghurt is such a great ingredients in cakes. Whatt?? This looks o beautiful the moment i saw it, i quickly scrambled over to your page! Girl you did great! :D I love it! I’ve always noticed that when baking with blueberries – the green… Must be some pigment in the skin or something. Regardless, you managed to make a beautiful photo. Thanks for the recipe, and for finding a new way to use our goat yogurt! I think your cake looks wonderful, but I understand that when you spend alot of time on your food photography, you want the food to look perfect. Must try that goat milk yogurt. Luckily we just had a Whole Food open near us a few weeks ago. It looks amazing…. Thank you for sharing this great recipe. We have made this recipe a few times (with minor substitutions of Greek yogurt and using 1/2 whole wheat flour) and they have gotten all thumbs up in this household. We just made these again today, except with orange peel/extract and dried cranberries. They are AH-MAY-ZING!!! You MUST try them. I made this cake over the weekend and I loved it and my husband loved it, too. I changed one thing the type of yogurt I used a Dannon greek yogurt instead of the goat yogurt. I was if I could use yogurt as ingredient for a cake and you showed that it could be done. Thank you for the recipe I will save this one. It’s great to hear that you and your husband enjoyed the recipe! Thank you so much for stopping in to share your experience making it. Have a lovely day and thank you for following MBA! Hi Jaime, love your work and creative ideas! I have a huge tub of strained Greek yogurt. Can that be used as a substitute? Thanks! I’ve baked a blueberry pound cake similar to this. The discoloration doesn’t occur if you dredge the blueberries on a little flour before adding to the batter. I baked this last weekend with fresh Maine blueberries and it was amazing! My daughter’s first birthday is today, and we are having a party for her this weekend. I was thinking of making this into cupcakes with a lemon buttercream frosting instead of the glaze. Do you think I would need to make any adjustments to the recipe for cupcakes, other than baking time? Thanks! I would just adjust the baking time, I’m glad to hear that you like the recipe so much! Thanks for stopping by. I made this yesterday and it turned out AMAZING! I didn’t have lemon extract so I used freshly squeezed lemon juice. I also used plain Greek yogurt. The lemon and blueberry combo is great. A definite keeper. So happy to hear you enjoyed the cake, Marie. Thanks so much for stopping by and leaving your feedback! I’ve made this recipe several times and it’s HUGELY popular. I’m going to try something different today though and would love input. Instead of the blueberry yogurt, I’m using their Strawberry goats milk yogurt. Thinking of maybe adding in some diced strawberries and putting a lemon glaze on it. Do you think it will work or will the fresh strawberries be too acid? Hi, Wendy! I say go for it! Let me know how it turns out! Hi, Lauren! I think a springform would work just fine. Be careful of the batter leaking through the bottom…you might want to wrap the bottom of the pan in aluminum foil before baking. Let me know how it goes!